We are engrossed in offering a commendable assortment of Tripple Pole Neutral Covered. These products are made by our adroit professionals, armed with wide industry experience & knowledge in this concern, using topmost raw material with the help of advanced machines. The offered products are available in various specifications & sizes as per demands of our clients. Moreover, the products offered by us are delivered within stipulated time frame. 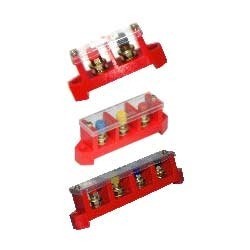 Established in 1986, in Faridabad (Haryana, India), we "Ess Bee Controls Private Limited" are a renowned manufacturer, exporter and supplier of Conical Busbar Support, Hexagonal Busbar Support, Finger Type Support, AC DC Connector, etc. The offered products are highly demanded for their features like light weight, perfect finish, easy to install, sturdiness, high strength and dimensional accuracy. The offered products are manufactured using high quality raw material and latest technology in adherence to international standards. The raw material we use in manufacturing process is procured from the trusted vendors of the industry. In order to make sure quality, these products are tested by our quality controllers on assorted parameters of quality. We provide these products to our clients as per their needs.